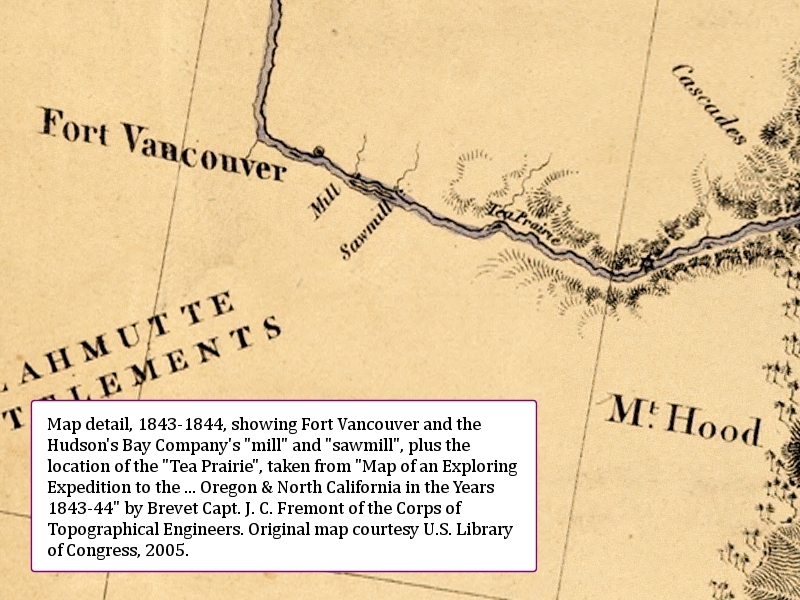 "Early Sawmills and Gristmills, Vancouver, Washington"
Click image to enlarge Map detail, 1843-1844, showing Fort Vancouver, the Hudson's Bay Company's "mill" and "sawmill", and the location of the "Tea Prairie". 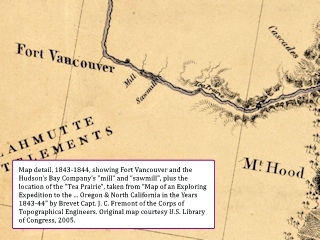 Original map: "Map of an Exploring Expedition to the ... Oregon & North California in the Years 1843-44" by Brevet Capt. J.C. Fremont of the Corps of Topographical Engineers. Original map courtesy U.S. Library of Congress, 2005. 1828 to 1829: The first sawmill for the Hudson's Bay Company was erected in the winter of 1828 to 1829 and contained one saw. 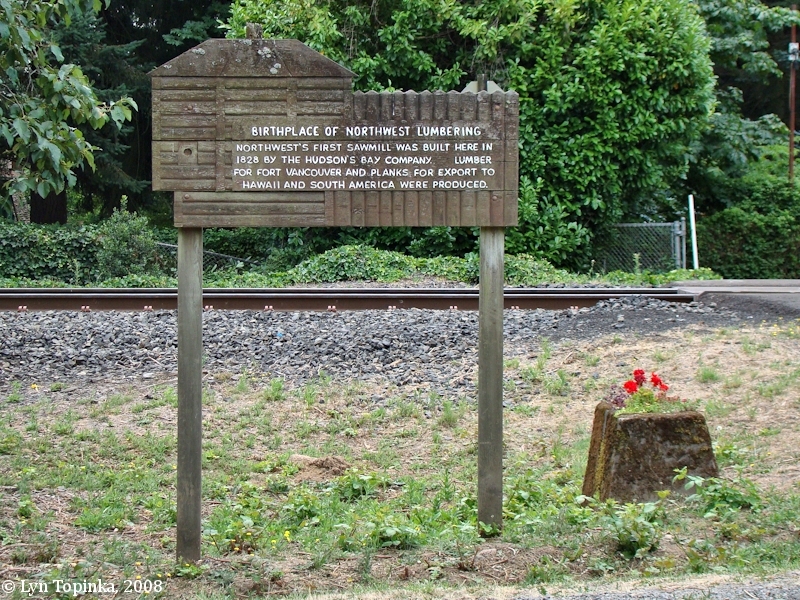 The mill was located seven miles east of Fort Vancouver and was constructed on the outflow from Columbia Springs for the Hudson's Bay Company upon the orders of Dr. John McLoughlin, Chief Factor of Fort Vancouver. 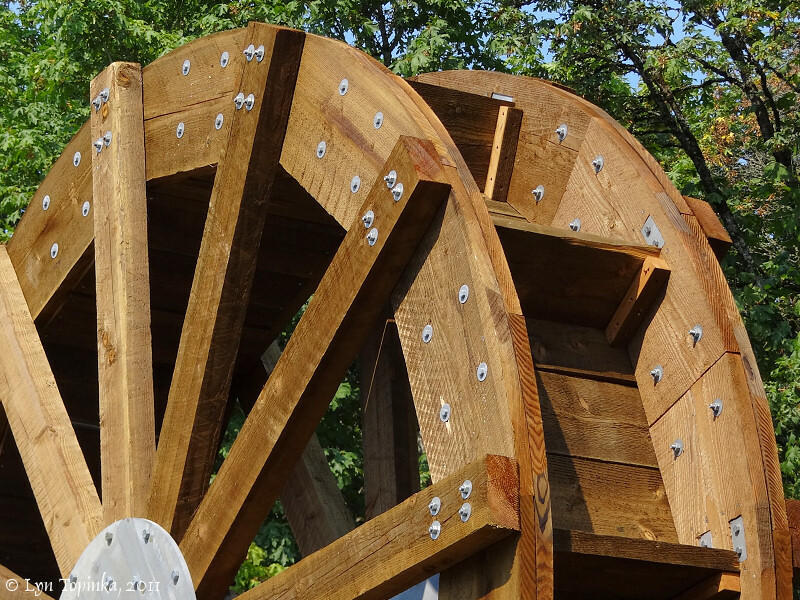 Built by William Cannon, the mill was powered by an overshot water wheel. 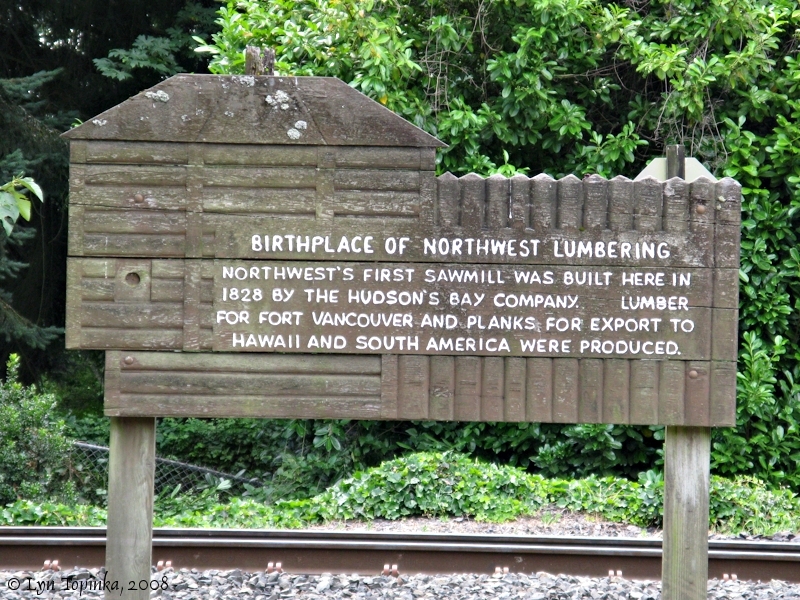 This mill provided lumber for Fort Vancouver and for export to California, the Sandwich Islands, and South America. The mill had a capacity of roughly 1,500 board feet of lumber per day. 1834 and 1838: In 1834 a second sawmill was constructed and began operation in 1835. The mill employed between 25 and 30 men and the capacity to out about 3,500 feet of boards a day. 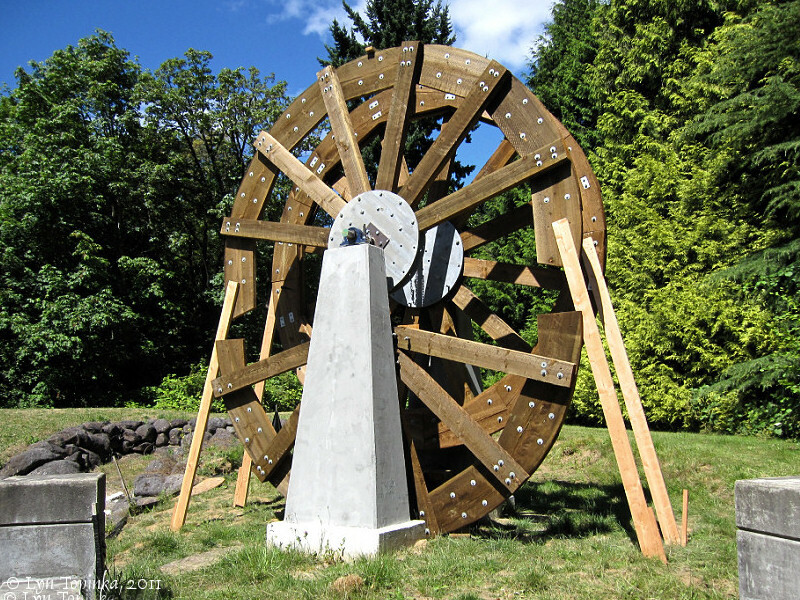 This mill was powered by an overshot wheel and worked 12 saws. This mill was rebuilt in the spring of 1838 and a Blacksmith shop was added. About ten or twelve yoke of oxen were employed to haul logs to the mill and finished lumber to the banks of the Columbia, where the boards were made into rafts to be floated down to the fort or were loaded directly onto ships for export. The mills did not operate on Sundays or holidays, and were frequently shut down for one reason or another; but when running, they were kept going day and night, with the employees working in regular shifts. It was this re-constructed 1838 mill which was described by Charles Wilkes in 1841 (see below). 1843: In 1843 William Frederick Crate, a London millwright, erected a new sawmill just a little lower down the stream than the Hudson's Bay mill. This mill was 91 x 30 feet in size, and was a "gang" mill, with nine saws comprising the gang and two more in a sash. It was driven by an overshot water wheel measuring 16 feet in diameter and eight or ten feet wide. The mill utilized an abundance of ironwork, most of it from England. Crate's mill was abandoned in 1849 when the few men able to operate it were lured away by the California Gold Rush. The remains of the gang mill could still be seen in 1853, but the building was "very rotten" and had fallen down. 1846: About 1846 the Hudson's Bay Company constructed another mill alongside that built by Crate. The dimensions of this new mill were 60 by 19-1/2 feet. It contained a single saw and was driven by a flutter wheel in a cistern which measured 16 by 8 feet. It was the only sawmill in operation at Vancouver in 1849. 1851: In 1851 and 1852 Crate constructed still another sawmill for the Company. It was located on the same stream as the others but on the opposite side and lower down. It measured 60 by 20 feet and had one sash saw, driven by an overshot wheel. It took a crew of eight to twelve men four months to build this mill. Later Crate changed it from a single motion mill to a "double motion geared up mill," an operation which took approximately three additional months. This new mill could cut three or four thousand feet of timber in twelve hours "without any driving." Soon after this mill was constructed, the old single-saw mill appears to have been abandoned. 1853 and 1856: In 1853 the Hudson's Bay Company ended its lumbering operations at the newest mill, and cited the mill was not meeting its expenses. At about the same time settlers came in and took up claims on the land formerly occupied by the Company and put a stop to the free cutting of timber. For these reasons, evidently, the Hudson's Bay Company discontinued its lumbering operations, although it appears to have kept a caretaker at the mills and to have sawed some lumber until about 1856. Also in 1853 Ervin J. Taylor laid claim to 320 acres which included the site of the last built Hudson's Bay Company mill. Then, about 1856, when Crate, then acting as the Company's caretaker, was absent, Taylor took possession of the mill and set it running "without sawing," thereby ruining some of the machinery. Then followed a long period of squabbling and litigation between Taylor and the officers of the Company, but Taylor maintained possession. He considered that the firm had abandoned the mill, as the building was open and "exposed to the ingress and egress of cattle." He repaired the mill and operated it for a period. On October 24, 1862, Taylor sold out to Lewis Love, who was in possession when mention of the Company's mill appears to fade from the records. A Hudson's Bay Company gristmill was built on Mill Creek, two miles west of the sawmill, near the location of today's Image, Washington. Mill Creek was said to have four falls within a short distance of one another, and each fall could produce between twenty-one and twenty-four horse power. All of the falls were situated within a half mile stretch of the stream and were so placed that a mill could be put along them "every fifty yards," or they could all be employed to operate one mill. 1825: During construction of the first Fort Vancouver, William Cannon is said to have fashioned a large mortar by hollowing out the top of a great fir stump. In this depression, wheat, peas, and other crops were pounded with a heavy wooden pestle attached to a spring pole. 1828: In or about 1828, Cannon constructed a more advanced type of mill on the rising ground north and west of the new fort. The machinery for this mill appears to have been imported from England, but persistent tradition maintains that Cannon fashioned the burrs from some "gigantic" boulders obtained locally. The new mill was generally operated by horse power, although oxen also appear to have been used for this purpose. 1839: After about 1839, a new water-power mill was placed in operation and the old mill back of the fort appears to have been abandoned. By 1849 it was in ruins, and apparently it was pulled down during 1850. Possible early Gristmill on Mill Creek: There is a possibility that as early as 1828 or 1829 the Company selected a site for a gristmill upon Mill Creek, about five miles above the fort, and there constructed another "primitive preliminary mill." At that time Jedediah Smith wrote that the Hudson's Bay Company possessed "a good saw mill on the bank of the river five miles above, a grist mill worked by hand, but intended to work by water." Another resident at the fort wrote that the establishment possessed a threshing mill, a flouring mill, and a sawmill, the "two last" of which were about six miles above the post. In October, 1832, Nathaniel Wyeth wrote in his journal that there were two gristmills at Fort Vancouver. 1838: By 1838 the primitive mill or mills in operation were no longer adequate to meet the expanded needs of the Columbia Department, and steps were taken to obtain more production capacity. "We have also constructed the machinery and prepared materials for the dam & building, of a water power Grist Mill, adapted for two run of 54 inch stones," Chief Factor Douglas wrote to the Governor and Committee on October 18 of that year. The site selected for this new structure was on the present Mill Creek, about two or three hundred yards from the bank of the Columbia. This stream had four falls within a short distance of one another, and each fall could produce between twenty-one and twenty-four horse power. All of the falls were situated within a half mile stretch of the stream and were so placed that a mill could be put along them "every fifty yards," or they could all be employed to operate one mill. William Frederick Crate, the miller from London, was in charge of the construction, and evidently he was assisted by John Stanger, also a miller at the fort. Between eight and twenty men were employed at the task, which occupied them "off and on" for about twelve months. The resulting building measured 40 by 20 feet and was three and a half stories high. It contained two pairs of stones and a wire bolting machine, "with every other convenience." The driving power came from an overshot wheel. Evidently the new mill was in operation by the fall of 1839. Thomas Jefferson Farnham saw the structure at that time and almost certainly was referring to it when he wrote: "The grist mill is not idle. It must furnish bread stuff for the posts, and the Russian market in the northwest. And its deep music is heard daily and nightly half the year." As late as 1841 the mill evidently operated only one pair of stones. But it was capable of grinding about 20,000 bushels of grain a year, which, according to Governor Simpson, was all that was required at the time. 1846: About the end of 1846 or the beginning of 1847 the Company erected another flour mill on the same stream as the first, but farther down. The new mill was larger, measuring about 60 by 40 feet. It was four stories high and was intended for eight or ten runs of stones. This new mill was never completed. It was described as having been about half finished in 1849; some three years later it was noted that the building was "up and covered"; and in 1854 Governor Stevens wrote that the new mill "frame" erected in 1847 was still not completed. Crate later said that when he last saw it, in the early 1860's, the new mill was still in good condition. He believed that at its highest stage of development it was "about half prepared for the machinery." 1849: As early as 1849, Crate and his wife had filed notice of a donation claim to a square mile of land near Fort Vancouver. The gristmills were included within the boundaries of their claim. As Crate later stated concerning the tract, "if I had not taken it, some one else would have jumped it." Unlike some of the other settlers, however, Crate recognized that the improvements erected by the Company upon his claim did not belong to him. He acknowledged that the gristmills were the property of the Hudson's Bay Company, and he continued to operate them as a miller until June, 1860. When the Company decided to abandon Fort Vancouver, Crate was ordered to send the machinery from the mills to the post for shipment to Victoria. He did send a large amount but did not bother to remove "such machinery as had been fixed in the mill." 1860: By 1860 the 1839 mill was somewhat decayed, particularly in the sills, and by 1866 one witness testified that it had rotted away entirely. How long the 1847 mill continued to stand is not known. It was still in good condition in 1860. An original stone from the Hudson's Bay Company Gristmill is on display at the Fort Vancouver Museum, along with other artifacts of the Hudson's Bay Company. 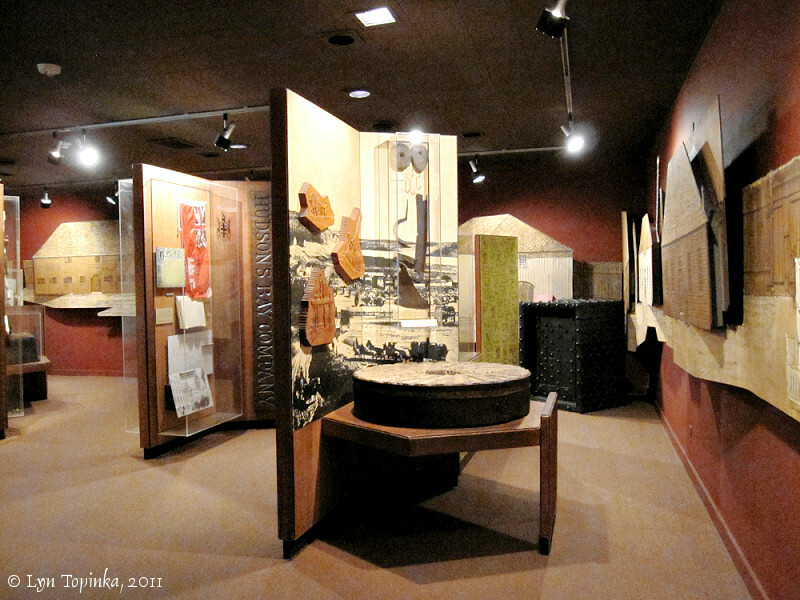 Click image to enlarge Museum displays, Fort Vancouver Museum, Vancouver, Washington. Image taken August 2, 2011. 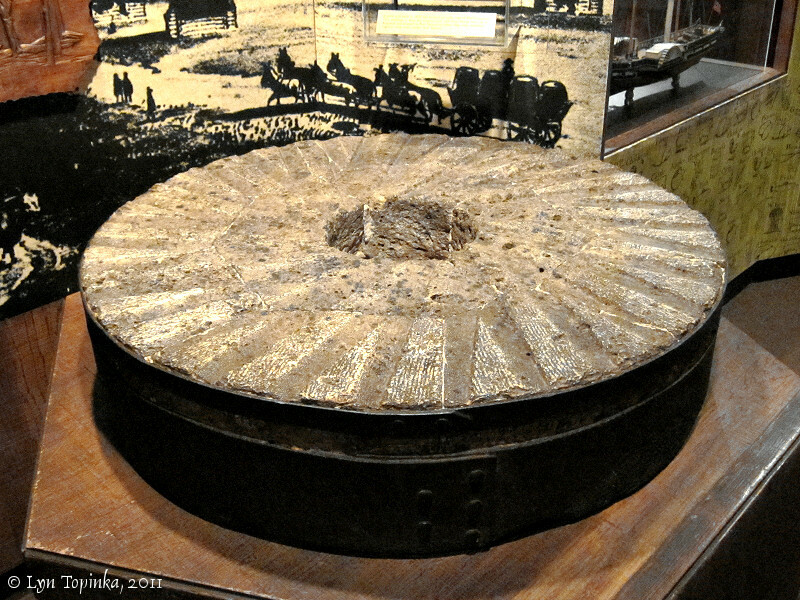 Click image to enlarge Gristmill Stone, Fort Vancouver Museum, Vancouver, Washington. Image taken August 2, 2011. In 1841 Charles Wilkes of the U.S. Exploring Expedition wrote about the Hudson's Bay Company's gristmill and second sawmill. 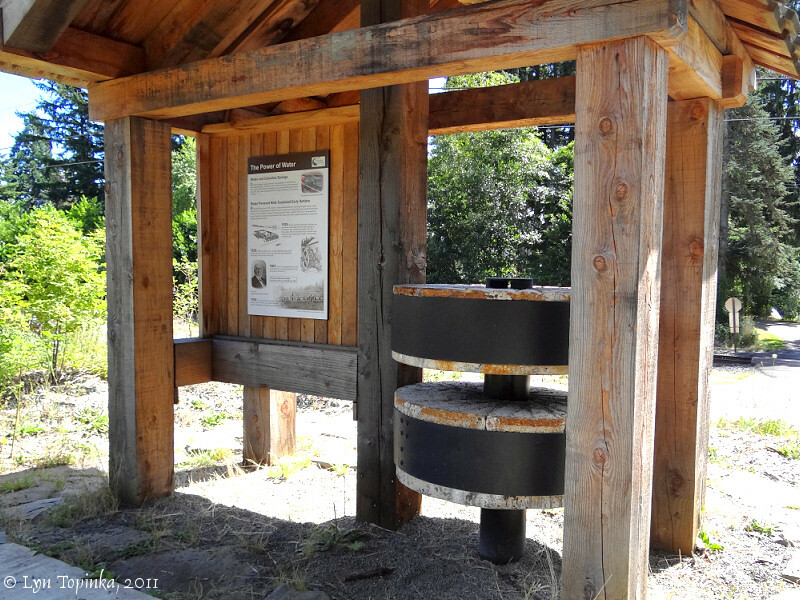 The gristmill was located near the location of today's Image, Washington, and the second sawmill was located at the location of today's Vancouver Trout Hatchery. One "substantilally built saw mill, 91 x 30 feet, and capable of working a gang of 11 saws, with an overshot wheel of 16 feet diameter." One "new single saw mill, 60 x 19-1/2 ft., cistern 16 feet long, 8 feet square." One "flour mill, 40 x 20 feet, 3 floors, with 2 pairs of sontes, a wire machine for dressing flour, with every other convenience." Several years later there were, in addition, a dwelling for the miller and a storehouse, both built of logs with shingle roofs. In all probability, these or similar buildings were at the mills in 1846. Source: Fort Vancouver Cultural Landscape Report, 2003. From 1862 until the early 1900s, Lewis Love operated a sawmill and a gristmill very near the location of the Hudson's Bay Company's sawmill. 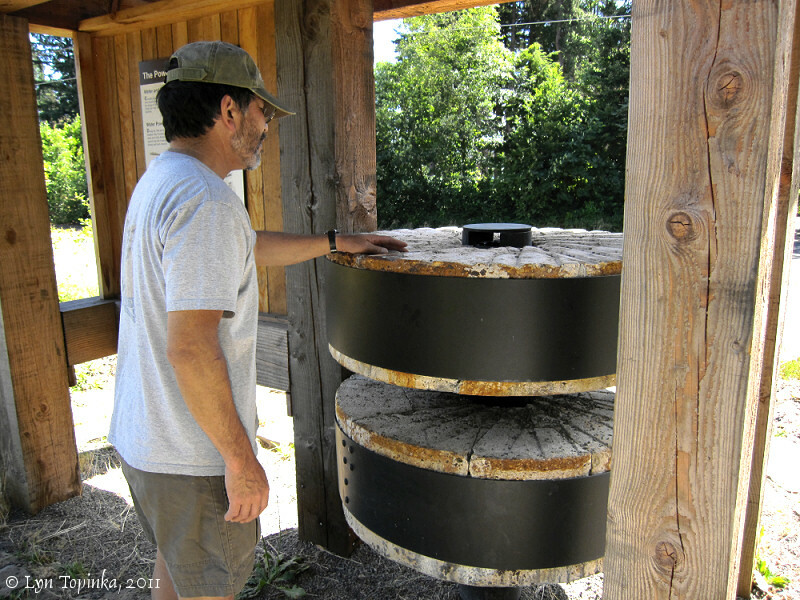 The stones from the Love's Gristmill are now on display at the Vancouver Trout Hatchery. 1862: Taylor sold his 320 acres to Lewis Love for $7,000. It included the site of the last built Hudson's Bay Company mill. Between 1863 and 1877, Love built a gristmill on the site. 1877: Both the sawmill and gristmill burned down. The gristmill was rebuilt and continued to operate until 1921. 1930: The Love family lost ownership of the mill as a result of a mortage foreclosure. Source: Columbia Springs Environmental Education Center brochure, "Step Back in Time", 2011. 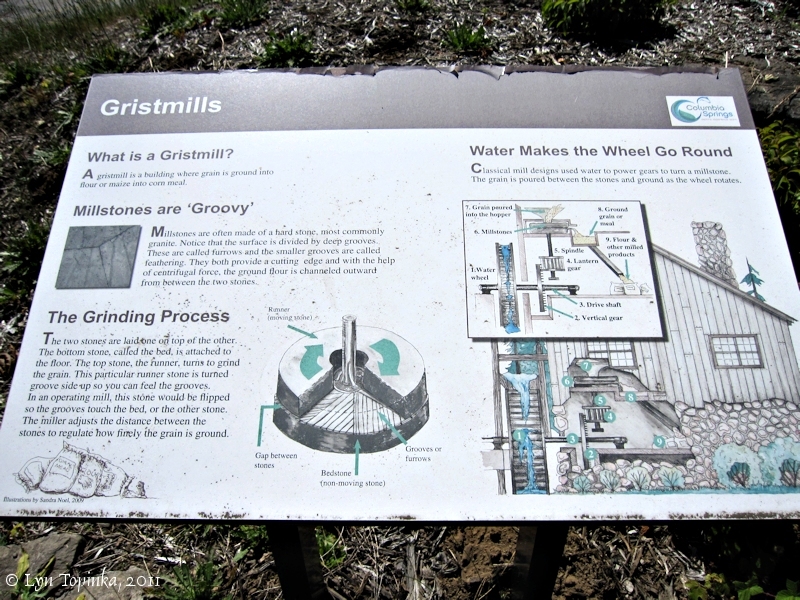 A gristmill is a building where grain is ground into flour or maize into corn meal. 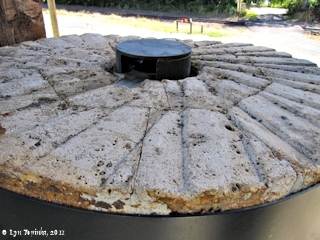 Millstones are often made of a hard stone, most commonly granite. Notice that the surface is divided by deep grooves. These are called furrows and the smaller grouves are called feathering. They both provide a cutting edge and with the help of centrifugal force, the ground flour is channeled outward from between the two stones. The two stones are laid one on top of the other. The bottom stone, called the bed, is attached to the floor. The top stone, the runner, turns to grind the grain. This particular runner stone is turned groove side up so you can feel the grooves. In an operating mill, this stone would be flipped so the grooves tough the bed, or the other stone. The miller adjusts the distance between the stones to regulate how finely the grain is ground. 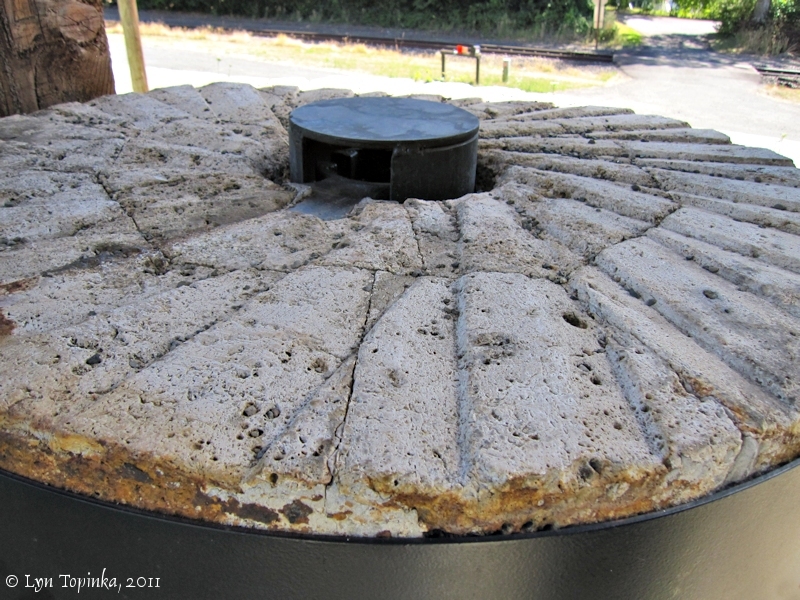 Classical mill designs used water to power gears to turn a millstone. The grain is poured etween the stones and ground as the wheel rotates. Source: Information sign, Vancouver Trout Hatchery, visited 2011. Click image to enlarge Sign, Gristmills, Vancouver Trout Hatchery, Vancouver, Washington. Image taken July 31, 2011. 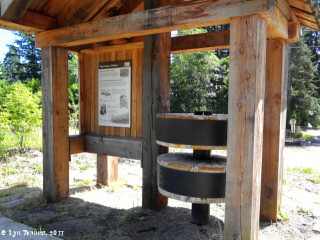 Click image to enlarge Lewis Love's ca.1866 Gristmill stones, Vancouver Trout Hatchery, Vancouver, Washington. Image taken July 31, 2011. "1938: The Vancouver Trout Hatchery was built directly across from the site of the sawmill, on the north side of the highway, as part of the Works Project Administration (WPA) during the Roosevelt era. 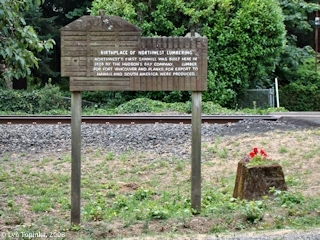 Opearted by the Washington State Department of Wildlife, it became one of the most popular attractions along the Evergreen Highway. 1996: The Vancouver Trout Hatchery was scheduled for closure but community partnerships saved the operations. 2001: A non-profit was formed. The partnership and hatchery grounds were named Columbia Springs Environmental Eduation Center." 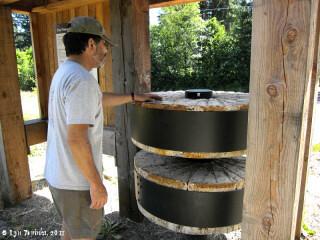 In July 2011 a replica water wheel was assembled at the Vancouver Trout Hatchery. 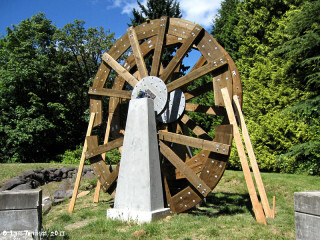 The replica wheel is 14-foot diameter and made of rough-hewn Douglas fir. The structure weighs over 7,500 pounds and rests on two 9-foot-high concrete pedistals. When finished the wheel will support 24 wooden paddles. It is expected to be complete in August 2011. 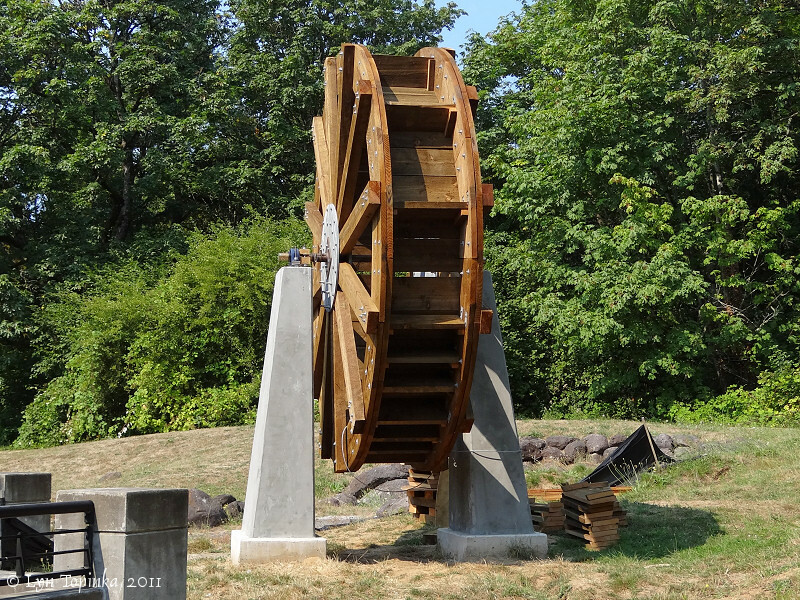 Click image to enlarge Under construction, Water Wheel replica, Vancouver Trout Hatchery, Vancouver, Washington. Image taken July 31, 2011. 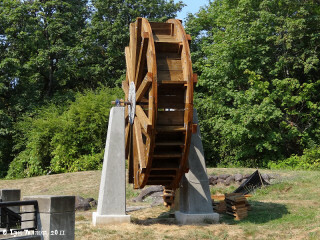 Click image to enlarge Water Wheel replica, Vancouver Trout Hatchery, Vancouver, Washington. Image taken September 10, 2011.